The vast archive of the Institution of Mechanical Engineers (IMechE) spans over 150 years in scope and is of National importance. So we were privileged to be selected by the Institution to build a Virtual Archive portal and publish their prestigious holdings online. 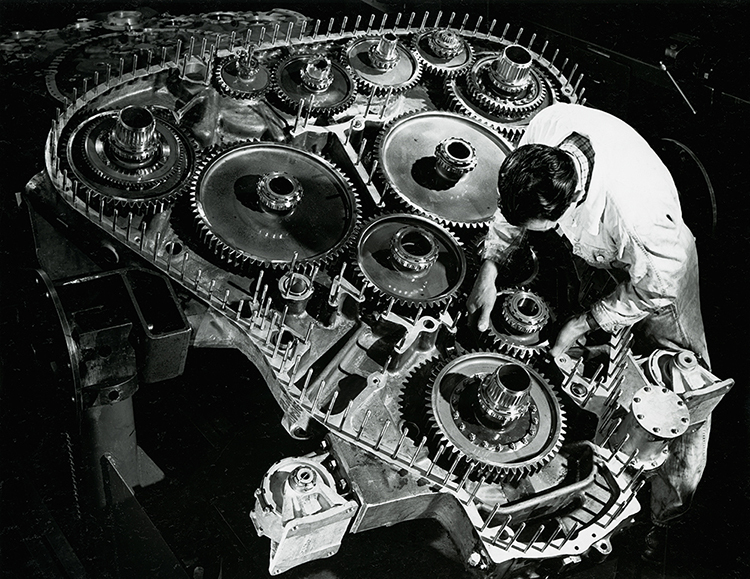 Above image: Napier Deltic engine, final gear being fitted at Liverpool Works. Image courtesy of IMechE. Just a few highlights from the collection include notebooks, letters and photos from engineer George Stephenson – builder of the first public inter-city railway line in the world to use steam locomotives – and Rolls-Royce co-founder Sir Frederick Henry Royce. As well as artwork by lauded automotive illustrator Gordon Crosby. As mentioned above, previously digitised items included notebooks, artwork, letters and photos from engineer George Stephenson, Sir Frederick Henry Royce, Gordon Crosby, and others. But despite access to these items being required on a daily basis by press and TV media, academic students and individual enthusiasts – most researchers wishing to view digitised items still had to visit the physical archives. The only remote public access was via a “poor” and not very visible picture gallery on IMechE’s core website, which featured only a few out of context selected images and not whole works. So though items had been digitised, the digital collection was almost redundant due to a lack of remote public access. Add in archive staff struggling to work with the “digitised soup” (to quote Karyn) of items and accessibility was a big barrier for IMechE. Another important aspect of the physical collection was a selection of IMechE’s Council Minute books and Karyn wanted the older books to be made publicly available alongside the 3D artefacts and other archival material that was only accessible by visiting. Also, digitisation is an ongoing process at IMechE and items are continuing to be scanned, for example Karyn recently approached TownsWeb Archiving regarding the digitisation of a microfiche collection. 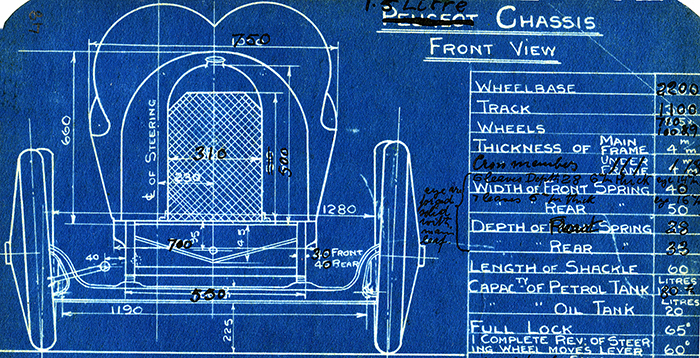 This continued digitisation could have meant that these problems would grow worse as IMechE’s digital collections grew. To Karyn it was clear that there was a greater need for public access to all items – both digitised and non-digitised, like their microfiche – and a large potential audience for the collection online. With some larger items, such as fragile A0+ architectural plans of IMechE’s HQ, no longer able to go on display or be accessed by researchers; a solution also needed to be found so that these larger items could be preserved, but also made remotely available. It was decided that by putting all of the digitised items on a publicly accessible Virtual Archive, this would help with the combined issues of preservation and inaccessibility. As mentioned, IMechE already had a large collection of digitised items, including the Council Minute books, which were historically digitised by TownsWeb. These minute books and a selection of loose council notes were initially digitised by our specialist digitisation technicians to master uncompressed TIFF formats. These were then converted to surrogate JPEGs, which due to their smaller file size are more suitable for display on the web as part of IMechE’s Virtual Archive. Having decided on a new online archive for the previously digitised items, like these important Council Minute books – Karyn decided that digitisation of the IMechE archive would continue. A slightly different approach would be taken for further digitisation and items selected to complement existing digitised content and build on themes. For example, digitising items related to the current, broader category of Railways, rather than creating new, smaller categories based around newly digitised items. Once the online archive had been set up, both historical and any future digitisation, such as the current microfiche project, would be imported, where possible. Following a consultation with Karyn and the team at IMechE, our IT developers set up an online digital archive – utilising PastView, an online management system as Karyn explains: “We worked alongside the developers at TownsWeb, who did an excellent job configuring PastView and importing all the digitised images so that they could be displayed on the new website. I gradually added all of the metadata to the records manually. With the metadata, it had to mirror the existing archive catalogue, but because it was going to be publicly accessible – the metadata needed to use mainstream language. I also created the themed collections based around the digitised content for use on the website – both this and the adding of the metadata were long, but vital tasks! If the metadata and themed collections hadn’t been added, the digital archive would have still been fairly inaccessible to the general public. 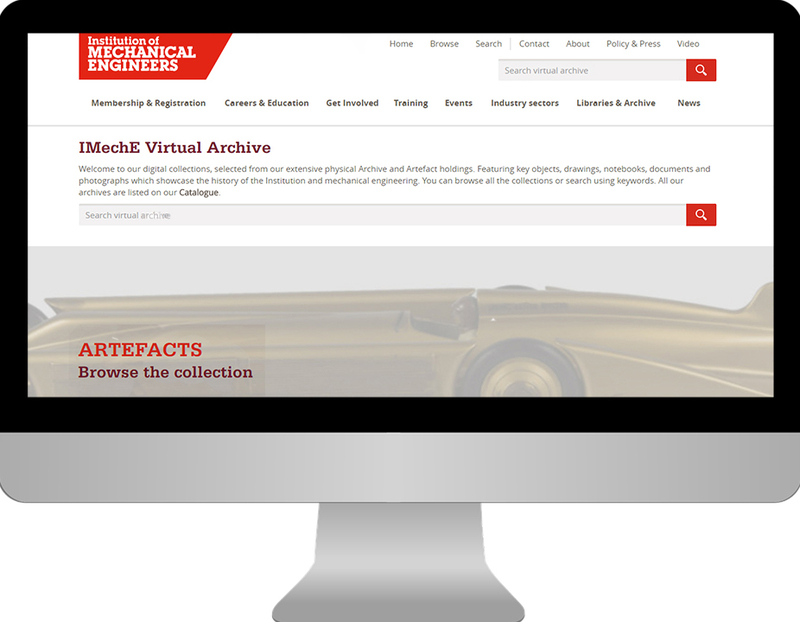 IMechE’s Virtual Archive is now integrated into the core IMechE website, with a variety of items showing the history of the Institution and mechanical engineering more generally, including the historically digitised items. 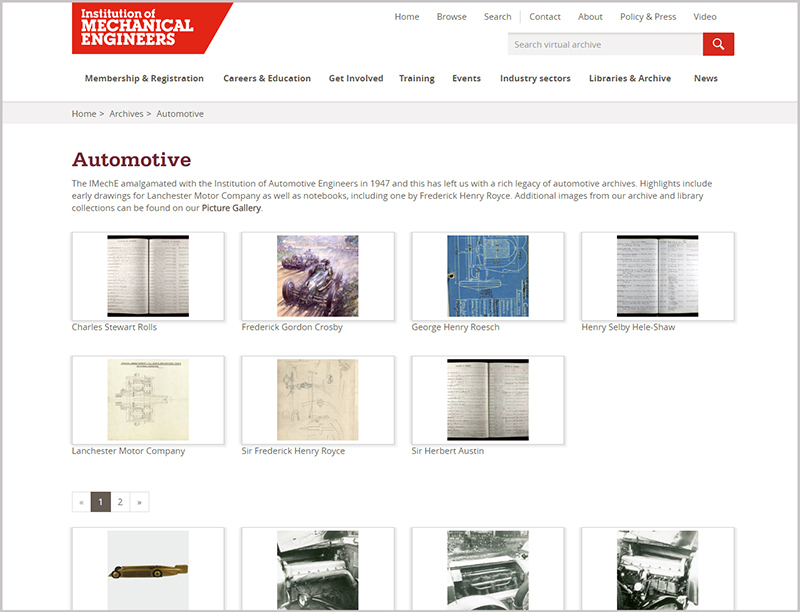 TownsWeb’s developers also designed the new Virtual Archive front-end discovery portal so that it matched and integrated with the main IMechE website aesthetically. This was particularly important as the main IMechE website was also going through the process of being redesigned and re-launched at the same time as the online archive was being developed. To further improve ease of access, the ability to browse by category was set up. For example those interested in automotive collections, can browse by this theme and find items including Frederick Royce’s notebooks, whilst other categories include Engines, Railways and Institution History. Alternatively users can search via the search key functionality using terms or keywords to find a specific item. Typed originals have been OCR’ed to make them more searchable an accessible. Although there are a variety of ways for improving access to collections, for Karyn making the collection freely available online seemed like the natural step. Now the previously digitised items are publicly available online and digitisation is continuing, building on themes and growing the virtual archive. These new digitised files will then be uploaded onto IMechE’s PastView system and displayed on the Virtual Archive website. Since launching in December 2015, IMechE’s digital archive has had almost 4000 users and the benefits have already been felt by Karyn: “Now we can make the most of previously digitised material – for example because they are available online – our Council Minute books have been placed in storage and the more fragile artefacts are only accessible to the public through the site. As an archive, we’ve already seen a rise in our profile and are seeing new audiences reached via this new virtual platform. In fact, in May 2016 we had 345 digitised archive users, compared with two physical visitors to the archive in May 2015. Researchers have told Karyn how they would not have been able to visit and their research would have been left incomplete. To find out more about IMechE’s collections, take a look at IMechE’s Virtual Archive or if you’d like to see other digital archives powered by PastView, take a look at our recent PastView installations.